Welcome to Flagamerican.com , Safe and Secure Online Shopping powered by Network Solutions. We have been offering our customers Wholesale Prices, Outstanding Service, and Excellent Quality flags MADE IN THE USA. We still answer our Toll Free telephone , call # 1-800-669-9639. If you have any questions or would like to place a custom order, please call us. We offer 30 day net terms for all CITIES, COUNTIES, AND VETERAN GROUPS. Please email us at sales@flagamerican.com or fax purchase orders to : 630-985-0770. God Bless all our Serviceman and Veterans. Thank you for serving and protecting our Great Country. CUSTOM PRINTED NYLON LOGO FLAG 3 FT X 5 FT, MADE IN THE USA, LONGEST LASTING. SEE QTY DISCOUNTS FOR THE LOWEST PRICES. STANDARD FLAGS ARE SINGLE REVERSE PRINT, READS CORRECT ON FRONT SIDE AND REVERSE IMAGE ON BACK SIDE. PROUDLY MADE IN THE USA. Nylon 2 FT x 3 FT Pennant Shaped Flag with Heading and Grommets, Made in the USA, Choose your size and color. Available in sizes 12 in x 18 in up to 5 ft x 8 ft. email us for larger qty quotes and colors, sales@flagamerican.com. Our Purple Heart Flags 3 ft x 5t ft Printed Flag with 2 brass grommets and canvas header, are MADE IN THE USA , heavy weight nylon, a 200 denier bunting specially treated to minimize sun and chemical deterioration. Welcome to Flagamerican.com, we the stock largest inventory of all types flags to meet your flag and banner needs. Over 100,000 flags in stock. Most stock items ship within 24 hours. 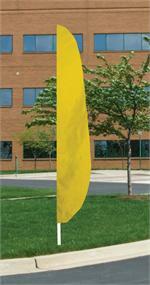 If you need a flagpole, we carry the following types: Fiberglass, Aluminum, and Giant Steel flagpoles. We have a Flag and Flagpole sale going on right now. Our flags are proudly made in the USA, but priced cheaply. We offer the the lowest flag pricing in the USA. 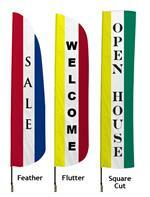 We carry the largest inventory of flags, flagpoles, and banners. We carry only top quality flags made right here in the United States. Our flags will last twice as long as competitor flags made overseas. You’ll find thousands of different types of flags for use at your Business, City, County, VFW, American Legion, DAV, Church, and School. We make custom flags and banners for every occasion. If you need advertising and promotional flags, give us a call, we can find something to fit your budget and attract new customers to your business. Even if you don’t see what you want on the website, we have them in stock or can make them for you, give us a call. USA Nylon flags are the most popular outdoor flags. They are attractive to look at, durable, affordable, and they fly with the least wind. 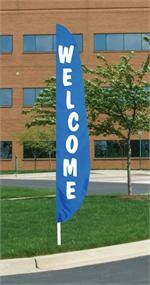 Our outdoor nylon flags are made of 200 Denier Nylon. USA Polyester flags are the most expensive. These are the heaviest flags, need the most wind to fly, but are the most durable. 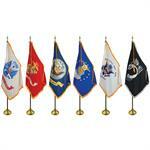 Military and POW flags to honor the veterans in your life. Sports Team banners and flags for sports fans to show support. 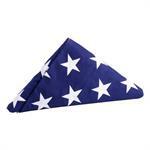 Grave Markers and Cemetery Spearhead flags for all the Cities, Counties and Veteran Groups. 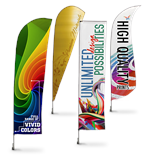 Custom Flags and Banners to meet your advertising and promotional needs. 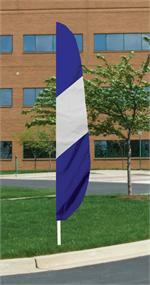 Chicago Flag Company, Illinois Flag Company, Action Flag Co., Eder Flag Co.
Feather and flutter attention flags are ideal for promotional use. We offer the longest lasting custom flags and banners at a wholesale prices.